Passing so-called “right-to-work” legislation has for decades been a central tenet of the agenda developed by the Koch brothers and their allies to tip the political balance toward Republicans in the battleground states. By using the power of government to undermine organized labor, these anti-union laws don’t just make it harder to organize and represent workers. They make it harder to mobilize grassroots support for progressive candidates who stand up to corporate power. That’s why Republican governors such as Scott Walker in Wisconsin and Rick Snyder in Michigan worked so hard to enact right-to-work——– laws after their states backed the reelection of President Barack Obama in 2012. Walker and Snyder succeeded, and both Wisconsin and Michigan—states with long histories of supporting Democratic presidential nominees—went narrowly for Donald Trump in 2016. So, too, did Indiana, where a right-to-work law was enacted after Obama won in 2008. Missouri is another battleground state. While it backed Trump by a solid margin in 2016, it still sends a Democrat (Claire McCaskill) to the US Senate and had a Democratic governor (Jay Nixon) until 2017. Missouri’s historically muscular unions, especially in the St. Louis and Kansas City regions, have done a lot to keep labor-friendly Democrats (and a few labor-friendly Republicans) in the running in the state. This has always unsettled corporate-aligned conservatives and their billionaire funders. For decades, they have been agitating for legislative interventions that would weaken Missouri unions. The corporatists finally succeeded last year in getting Republican legislators and a newly elected Republican governor to approve a right-to-work law. 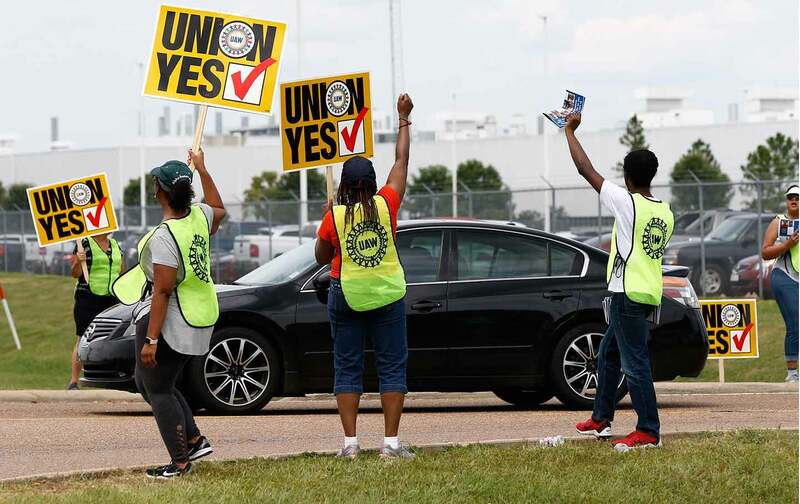 But union activists gathered enough petition signatures to put the new law on hold until voters could weigh in on whether they wanted lower wages and fewer protections on the job. The voters will do that on Tuesday, when Missourians are to decide the fate of Proposition A, a statewide referendum that will provide a vital measure of the ability of organized labor to defend worker rights. A “yes” vote will make Missouri a right-to-work state. A “no” vote will preserve the rights of workers to collectively bargain—and the full ability of unions to fight for fairness in the workplace and in society. This is not just about Missouri workers. Overturning the right-to-work law in this key state could renew hopes for workers everywhere, argues national AFL-CIO President Richard Trumka, who says that such a victory would signal that the labor movement has figured out how to beat the money power. Trumka says unions have campaigned to block right-to-work in Missouri with “the biggest, deepest member-to-member program” in years—contacting more than 500,000 voters on the doorstep and by phone. Trumka provided a sense of perspective on the Missouri fight when he traveled to St. Louis in mid-July to address delegates to the state AFL-CIO convention. A labor victory in Missouri, said the former United Mine Workers president, could be a turning point for union members nationwide.